Google Authenticator is an app created by Google Inc.. Google Authenticator has a rating of 4.3 on the Play Store, with 145370 votes. Similar apps are: Google Handwriting Input (by Google Inc.), Android System WebView (by Google Inc.), Spaces - Small Group Sharing (by Google Inc.), Android Device Manager (by Google Inc.), Google Text-to-Speech (by Google Inc.), Google Home (by Google Inc.), Google Opinion Rewards (by Google Inc.), Google Now Launcher (by Google Inc.), Google Talkback (by Google Inc.), Google Keyboard (by Google Inc.), Google Quick Search Box (by Google Inc.), Google Translate (by Google Inc.). 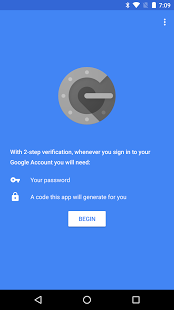 Google Authenticator is currently available in the following countries: Peru, Switzerland, Romania, Israel, Turkey, Thailand, Germany, China, Japan, Netherlands, Denmark, Slovakia, Greece, Ukraine, United Arab Emirates, Poland, Estonia, Chile, Australia, Austria, Singapore, Indonesia, Czech Republic, South Korea, Colombia, Croatia, United Kingdom, France, Serbia, Sweden, Latvia, Lithuania, Norway, Finland, Hungary, Belgium, Hong Kong, Spain, Taiwan, Philippines, Russia, Malaysia, Bulgaria, India, Canada, Mexico, South Africa, Italy, Brazil, Portugal, Argentina, Saudi Arabia, New Zealand, United States, Egypt, Vietnam. #1 File Transfer Tool! Offline Transfer! Amazing Speed! Cross-Platform!